Longitude 50.034296. Latitude 2.280462. Located at the eastern-side of the town is the famous site known as the Underground City of Naours with its entrance in the side of a tree-covered plateau of land near the D60 Rue de ‘l’Abba Danucourt highway and a little way along the Rue de Carreres road. There is an admission fee to pay but guided tours are available. The underground caves, grottos, passageways and chapels that make up this ancient settlement are 33 metres 106 feet below ground and the pathways linking these run for between 1-2 miles in a westerly direction and under the streets of Naours itself. It is thought the underground settlement, also called a souterraine, dates from the 3rd century AD. The town of Naours is in the far north-east corner of France not far from the border with Belgium. Amiens is 10 miles to the south. The Romans were the first people to dig into the plateau back in the 3rd century and, in subsequent centuries local people continued digging out the caves and grottos. Maybe early Christians hid below the ground in order to escape their persecutors – they would certainly have had plenty of places to hide and set up little chapels. Then in the 9th century AD Viking invaders lived in these underground caves. In more recent times local peasants made their homes in the vast network of caves turning the place into a large underground settlement, complete with extensive passageways and more chapels, shelters and wells, in fact, everything to allow them to live below ground without the need to venture out into the town of Naours, something akin to being almost completely self sufficient. It is said that upto 3,000 peasants lived in the underground settlement, and even farm animals were kept underground! Rotonde de la Sainte Vierge, Underground City of Naours, France. There are three chapels, one of the best is called Rotonde de la Sainte Vierge (Chapel of the Virgin) where high up on a rocky ledge stands a statue of the blessed Virgin Mary holding baby Jesus. The other chapels also house similar statues. 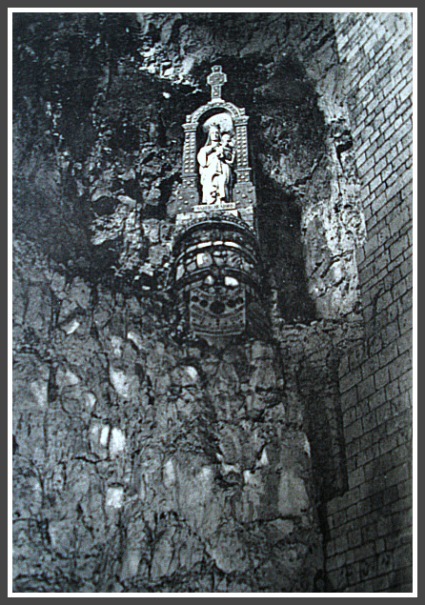 The entrance to the underground city was re-discovered by a local parish priest, Abba Danicourt, in 1887. In total there are 28 galleries and 300 chambers or rooms. 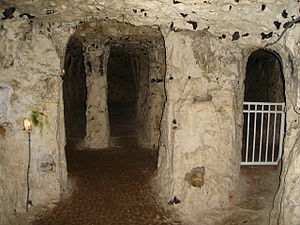 During the great war (1914-18) soldiers fighting on the battlefields of the Somme are said to have lived in the caves and, later during the 2nd world war (1939-45) the German high-command apparently used the cave system for their headquarters. You can still see the graffiti that soldiers have left behind on the walls. Truly this is an interesting place to visit and although it is now a tourist site it is well worth taking a guided tour of this vast underground complex, and be amazed at what actually lies beneath the streets of the town of Naours – and yes it is an underground city! Categories: Caves / Rock Shelters, Souterraine / Fogou, Underground City Of Naours In Picardie France | Tags: Underground City Of Naours In Picardie France | Permalink.